One of the attractive things about signing Ryan Doumit was the promise of defensive versatility. 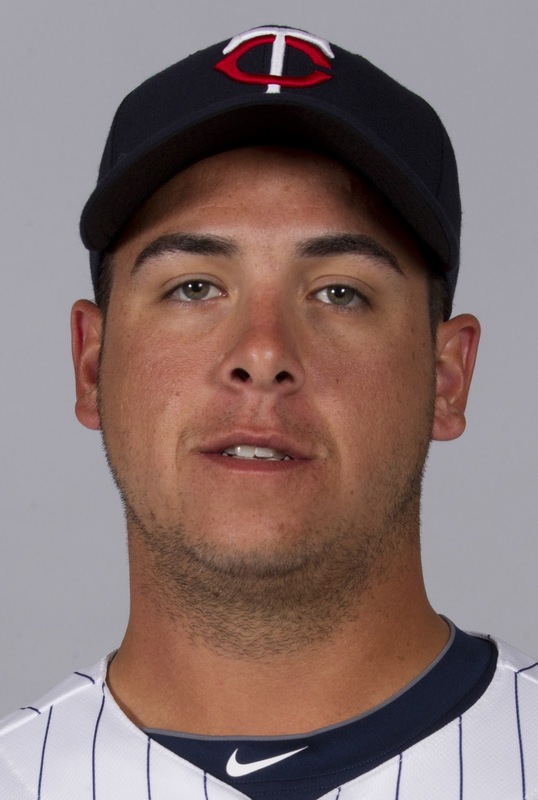 While primarily a catcher, he has also played right field and first base some in the big leagues. This is not to say that he's particularly adept at any of these positions, but he figured to see some time filling in at each. But Doumit didn't sound too thrilled with the prospect of playing first base when he signed in December, and he apparently hasn't warmed to the notion since. Ron Gardenhire said Monday first base is not in the plans for Doumit. This decision fits Gardenhire's style perfectly. He's not going to force an established player to play someplace he's uncomfortable -- not, at least, if there's someplace else the guy can play that helps the team. Gardy may have had Doumit play a little first base during the infield drills during this first week or so and realized that that prospect made two people uncomfortable: Doumit and Gardy. But this raises some questions, not the least of which is: Who's the backup to Justin Morneau if not Doumit? This is a different question than "Who's the first baseman if Morneau's concussion problems re-emerge?" If Morneau goes on the disabled list, somebody will take his place on the active roster, and that somebody is likely to be the regular at first. This question assumes that Chris Parmelee and Aaron Bates and Steve Pearce are all in the minors and Morneau is due for a day off. Joe Mauer. The Twins plan/expect him to catch 120-130 games this year, but that leaves a couple dozen for him to DH, play a different position or sit. Mauer will probably rotate out to first with some regularity, with Doumit catching if Morneau is to stay in the lineup as the DH. Luke Hughes. The Aussie is out of options. He is likely to make the roster as a utility man -- second base, third base, first base. Assuming, of course, that his shoulder injury (sustained in a collision in winter ball in his homeland) does't put him on the disabled list. Trevor Plouffe. His primary focus this spring is supposed to be the outfield. He hasn't played much at first in the minors, so tossing him into the first base mix might be a bit of an adventure. Still, it might be away to get his bat into the lineup against a lefty. With Joel Zumaya officially out of the 2012 picture, who among the 32 pitchers left in camp benefits? Well, toss out the seven guys with seven-figure salaries (the five putative starters plus bullpenners Matt Capps and Glen Perkins). They are, if anything, worse off now, because a healthy Zumaya would have made their pitching chores a bit lighter. Of the remaining 25, the six lefties (Brian Duensing, Scott Diamond, Matt Maloney, Phil Dumatrait, Aaron Thompson and Tyler Robertson) are relatively unaffected. They aren't candidates for the right-handed set-up job Zumaya was ticketed for. Duensing is likely to be the second lefty in the pen regardless. Now exclude Liam Hendriks, who won't be in the major league bullpen. That still leaves 18 right-handers looking for jobs, with a high-leverage role up for grabs. The Twins want a power arm to match up against right-handed power hitters. LaTroy Hawkins held that role in Ron Gardenhire's first couple seasons as manager. 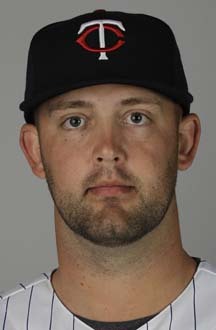 Then came Jesse Crain, with short-term appearances from Grant Balfour and Pat Neshek. This is the role Jim Hoey was supposed to inherit last season and in which he failed so utterly. This is the role Zumaya was intended to fill. So one might think the hard-throwers among the 18 would be the primary beneficiaries of Zoom-Zoom's misfortune. But I suspect that Gardenhire and pitching coach Rick Anderson would have been reluctant to use Zumaya as frequently as they did Crain or the Hawk. They would have avoided using him on consecutive days; they would have been reluctant to use him to finish one inning, sit for a while, then pitch the next inning. They would have wanted a second power arm. Split the 18 into two groups: Power guys and pitch-to-contact (* indicates that he's on the 40-man roster). Power arms: Jason Bulger, Jared Burton, Lester Oliveros*, Esmerling Vasquez, Luis Perdomo, Casey Fein, Alex Burnett*, Deolis Guerra*. Pitch-to-contact: Brendan Wise, Carlos Gutierrez*, Kyle Waldrop*, Jeff Gray,* Anthony Swarzak*, Terry Doyle*, P.J. Walters, Daryl Thompson, Steve Deduno, Jeff Manship*. These are not necessarily exact classifications. Burnett pitches as if he's a power arm, but he really hasn't missed many bats. Deduno does miss bats, but he relies on a good curve ball, not on velocity. Odds are that Swarzak will be on the opening roster. Doyle, a Rule V pick, is perhaps only slightly less likely. Both profile as long relievers, better suited to working multiple innings than to coming in to get one or two crucial outs with men on base. back to the White Sox. Slot one of the power arms in the SU2/MR1 slot. The MR2 job might be a second power arm -- as I figured would be the case if Zumaya made the roster -- or it might be a pitch to contact guy, although this formation already has Doyle and Swarzak from that group. Five guys I'll be trying to keep tabs on: Bulger, Barton, Guerra, Gutierrez and Oliveros. never again: Joel Zumaya throws a baseball. We all knew when the Twins signed Joel Zumaya that he was a serious health risk. That he lasted all of 13 pitches into a batting practice session Saturday was a bit of a surprise, but not a big one. Thirteen pitches was enough to shred an elbow ligament. Added to his vast assortment of previous injuries — from finger strain to wrist strain to fractured elbow to separated should — it might be enough to end his career. Justin Morneau said last week of his concussion problems that there's a limit to how long he is willing to torture himself to play. Zumaya probably knows the feeling. He has one of the great fastballs of my 40-plus years as a fan, and that's saying something. Even after all those serious injuries, he can still bring the heat. Terry Ryan told reporters Sunday that it was not a day for him to talk to Zumaya about his future. But he will. 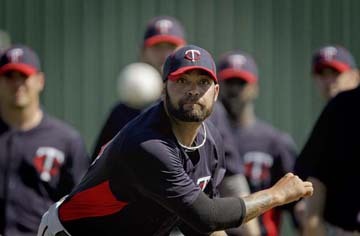 The Twins have the option of cutting Zumaya loose; his deal contains "just" $400,000 of guaranteed money. That's a lot to you and me, but it's almost $100,000 less than the major league minimum. But I can imagine Ryan, when he and the fastballer talk this week, making this proposal: Sign another incentive-heavy, non-guaranteed deal, commit to the Tommy John surgery and the rehab that comes with it, and we'll put you on the 60-day DL rather than release you and promise a spot on the 40-man roster for the offseason. Zumaya might accept that offer. Or he might decide he's tortured himself long enough. I don't think anybody could blame him if he gave up on the cursed talent of his right arm. ball during an informal workout in Surprise, Ariz.
With spring training now in full swing, my Sunday feature reverts to Pic of the Week. 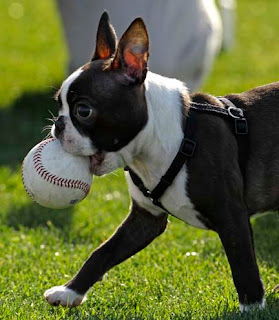 This dog must have a pretty good bite to get a grip on the ball. Dave Bigham — Mankato native, junior hockey player, left-handed minor league pitcher, real estate broker — died Wednesday. He was 41. I didn't know him well; indeed, I barely knew him at all. I had just one encounter with him that I can recall, but it was good enough to justify a post. It was the summer of 1991. Bigham was in his third season in the Twins system, pitching for their Kenosha affiliate in the Midwest League. Jim Rueda of the Free Press sports staff (now our sports editor) and I took something of a busman's holiday — Milwaukee, Kenosha, Chicago, Madison — to see games in those parks. 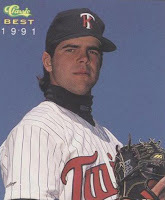 I planned to write about the fan experience; Jim planned stories on Bigham, a Mankato West grad, and Todd Revenig, who had pitched for Mankato State and was then in the Oakland system and pitching for the Madison Muskies. We had a breakfast appointment with Bigham at a restaurant near the Kenosha park the morning before a day game. He was amusing and chatty. More than 20 years later, I remember his story about Midre Cummings, a talented outfield prospect who gave less than optimal effort. Joel Lepel, the Kenosha manager (and another MSU grad, now the Twins minor league field coordinator) installed the "Midre-meter" in the clubhouse, a dial on which the other players could predict how hard Cummings would play that day. The Midre-meter was off the charts the day Rick Sutcliffe made a rehab start against the K-Twins, Bigham told us, and Cummings hit a long homer off the major leaguer. At some point during our breakfast, Bigham pointed out the window at a young man walking toward the park. "There goes the next shortstop for the Minnesota Twins," Bigham said. As it turned out, Denny Hocking never got the job, but he did have the longest major league career (13 seasons) of anybody on the 1991 Kenosha Twins (although Damien Miller wound up with more career at-bats). Bigham himself never reached the majors, never even got out of A ball. My recollection is that he was never able to find an arm angle from which he could throw both a reliable breaking ball and get fastball movement. He was, in effect, tipping his pitches with his basic delivery, a flaw that higher-level hitters were bound to exploit. He spent eight seasons chasing the baseball dream, then went on to other things, which included years of amateur ball. Friday at the Twins complex in Fort Myers, Fla.
Lake Crystal's most famous part-time resident spoke Friday to the assembled reporters at Twins spring training, and his comments are being dissected with the detail generally used for analyzing presidential statements on foreign crises. 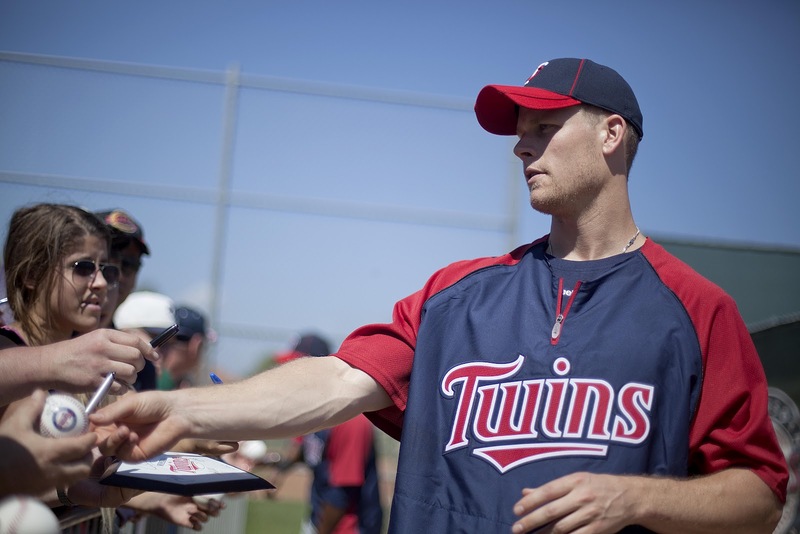 Such is the importance of Justin Morneau to the Twins, not only in 2012 but beyond. A healthy Morneau is a middle-of-the-lineup force, but he hasn't had a fully healthy season since 2008, and the last two have been shortened and marred by recurring concussions. Tomorrow isn't promised to any of us. Morneau knows that all too well. "I don't think there will be a career if it's something I'm dealing with (for the long term). That's the reality of the whole thing. I'm obviously not going to continue to mess around with this if it continues to be a problem. There comes a point where you can only torture yourself for so long. It's something I love to do but you keep preparing and you keep being left out. That's something that nobody wants to go through." Yes, that sounds like a guy who has contemplated retirement. Is that really a surprise? Had he denied retirement as an option, I would scoff. Had he come out claiming that all is well, I would be skeptical. He's had a year and a half of recurring concussion symptoms, and he doesn't know if he's out of the woods yet. He's also not ready to pull the plug on his playing days. We shouldn't be eager to do so either. The Twins are obviously banking on Morneau. They've committed $14 million to him in each of 2012 and 2013. I'm not sure how much of that, if any, is covered by insurance. (As a general thing, teams can no longer realistically insure contracts from injuries that the player has had before, and Morneau's concussion history predates his current deal.) They have some low-priced options in reserve, but they'd much prefer to keep them in reserve. For now, the status remains quo. Morneau is playing. He took part in the drills Friday. I'll evaluate the various Plan B's if and when he has to back off. Election Day, 1982: I am working for the newspaper in Detroit Lakes, Minn., spending election night in the Becker County courthouse watching the vote come in. Becker isn't the biggest county in Minnesota, but it has some size to it, and Detroit Lakes is very near the southern border. Two Inlets Township, in the county's northeast corner, is a long haul to the county seat, made even longer by the fact that all the roads run east-west or north-south -- no diagonal shortcuts. If memory serves, it was close to 50 miles of driving. We're starting to push midnight, everybody else is in, and we're still waiting for Two Inlets. The county auditor picks up the phone, calls the township clerk, wakes him up, asks where the ballots are. The clerk says, Right here, I brought 'em home with me and I'll bring them in in the morning. The auditor tells him that he will bring them in right now, and if they aren't in the courthouse within an hour he'll send a deputy out to get them, and him, and the clerk won't be going home until he gets bail. That's what I thought of Thursday afternoon when I learned that Ryan Braun's suspension had been overturned, apparently on the basis that the guy who collected the urine sample took it home for the weekend rather than send it to the lab immediately. You don't take the ballots home with you, and you don't take the urine sample home either. Same principle. Ryan Braun, it's almost spring training. Do you know where your suspension is? Baseball's drug testing procedure is supposed to be confidential, and it usually is. Nobody outside the process is supposed to know about a player testing positive (which is a negative) until the ruling comes down, and even then the specifics aren't revealed. 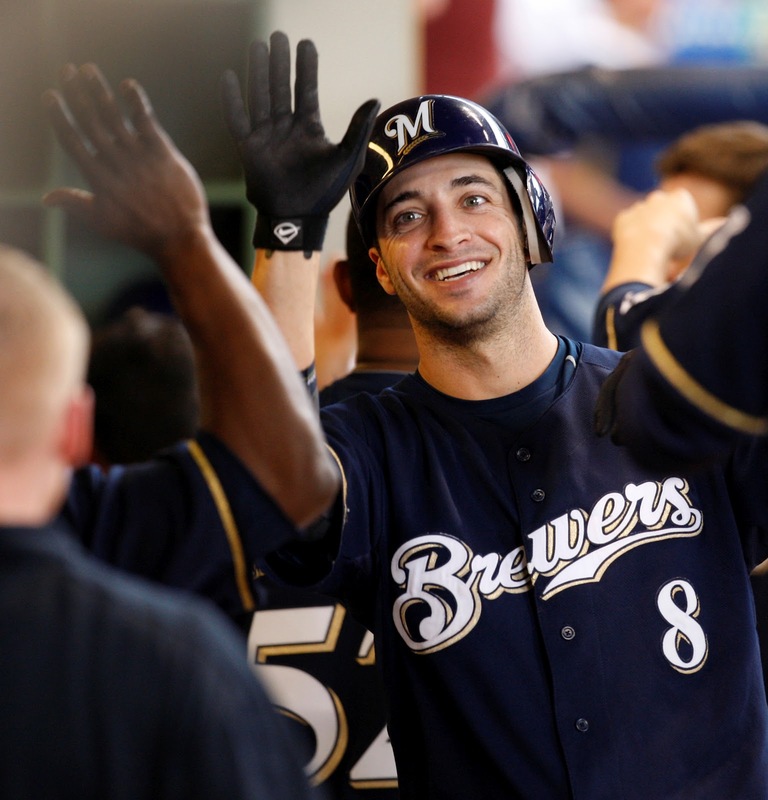 The Ryan Braun case has been anything but confidential. We learned, via leak, back in early December that the 2011 National League MVP had been tested during the postseason and found to have an "insane" testosterone level. I regarded the leak itself as odd enough to be suspicious, raising the possibility that someone involved in the testing realized the result may be flawed and decided to muddy the waters by making it difficult for the appeals panel to toss out the result. 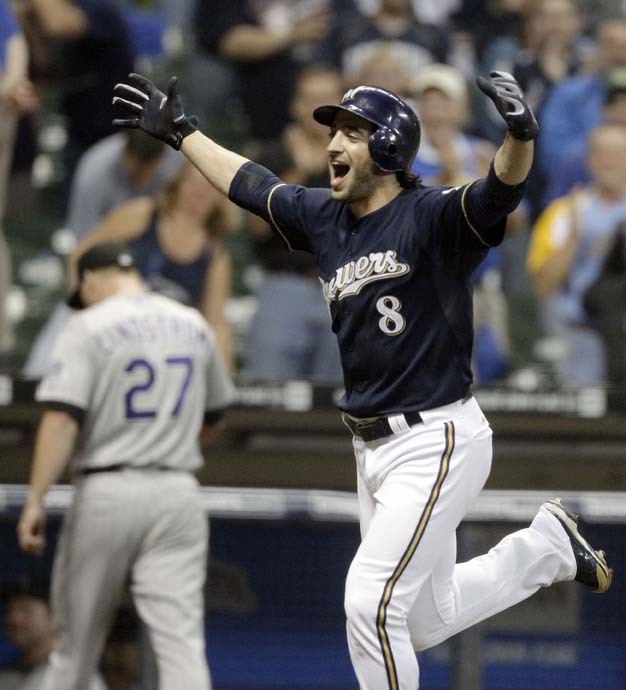 Braun had his appeal hearing last month. Normally there's a 25-day window for the panel to rule; in this case, it's been more than a month. Maybe it's an innocent delay. Maybe, since there are no games, and Braun isn't even required to be in camp until Friday, the panel has seen no urgency in issuing its ruling. I would think, however, that if it were a cut-and-dried result, there'd be no cause to drag it out. Issue the suspension and get on with life. Or maybe Braun has a legitimate case, and the panel is trying to find a way to exonerate an innocent man without damaging the credibility of the testing process. If that is the case, of course, the damage will have been done not by the appeals panel but by the leaker of a faulty result. I have suspected, and frequently written, that Twins manager Ron Gardenhire was never all that happy with Jason Bartlett as his shortstop. I inferred this from the manager's reluctance to play Bartlett when it came time to replace Cristian Guzman and his harping on Bartlett's willingness to defer to such veterans as Luis Castillo and Tony Batista. Bartlett became the regular shortstop in 2006 after Gardenhire was stripped of his alternatives. Terry Ryan released Batista (with Nick Punto taking third base) and traded away Juan Castro. Bartlett's defense was a big factor in the Twins' surge in 2006; the next season, he committed a string of errors that helped bury the Twins early in games down the stretch of a disappointing season. Ryan stepped aside late in 2007, and new general manager Bill Smith quickly included Bartlett in a big trade with Tampa Bay. And the Twins really haven't been stable at shortstop since. They opened 2008 with Adam Everett at short and finished it with Punto there. They opened 2009 with Punto and ended with Orlando Cabrera. They traded for J.J. Hardy for the 2010 season; he didn't play 100 games. They moved Hardy and spent 2011 with a patchwork of incompetence (Tsuyoshi Nishioka, Alexi Casilla, Trevor Plouffe and Matt Tolbert). 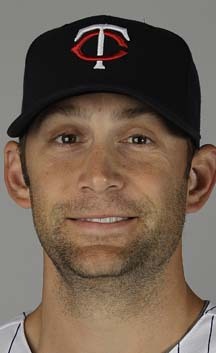 Now they intend to open 2012 with Jamey Carroll, a 38-year-old career utility infielder, at the position. I drag all this history up because on Tuesday Brett Bollinger, the MLB.com Twins beat reporter, posted a piece that said Gardnehire, talking about Carroll at short, said that he was never in favor of trading away Bartlett. Maybe so. My inference was drawn from the doubtless simplistic equation: Gardenhire was reluctant to play Bartlett in 2005-'06; when Bartlett got the job in May of '06, it was because he was the only choice Ryan left Gardenhire; Bartlett made some crucial errors in '07; Ryan retired; and Bartlett was quickly out the door. I wasn't, obviously, in the meetings, and I don't know what Gardenhire really thought of Bartlett then (or now). Certainly somebody (or somebodies) in the Twins organization underrated Bartlett at the time; he turned out to be the best player in what remains known as the Delmon Young-Matt Garza deal. Whether it was Gardenhire or Smith or somebody else, I don't really know, but I continue to doubt that Smith was substituting his judgement for that of the organization's more experienced evaluators. I don't think it matters now; Bartlett is now with San Diego as a 32-year-old shortstop who hasn't hit for two seasons. Were he still a Twin, they might still have a shortstop question. 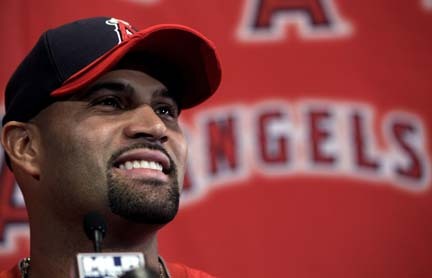 Albert Pujols at his Monday press conference. Yes, I intend to collect my money. I've successfully avoided SportsCenter for a few days, so it fell to a co-worker to inform me that ESPN was making a big deal out of Albert Pujols showing up at spring training with his new team. TEMPE, Ariz — Albert Pujols announced Monday that he was skipping training camp, citing writers' cramp from the exertion of inking his $240 million contract. Pujols has been a great player, and he's probably still got some mileage on his tires, but I fully expect the Anaheims to regret the contract before it's all over. The total exceeds what Artie Moreno paid for the franchise by some $50 million. It's frequently discombobulating to see a great player with a different team, but in this case the visual shock may not be so great. The Angels and the Cardinals both rely on a bright red as their primary color. Pujols in Yankees pinstripes, that would be a jolt to see. Play good defenders in the field and throw strikes. As much attention as the Twins' inept middle infield defense drew during last season's disaster, an overlooked problem was on the mound -- which is odd because while defense remains difficult to reliably quantify in the stats, command and control isn't. The Twins, and in particular their starting pitchers, simply didn't command the strike zone as reliably in 2011 as they had in the past. As a staff, the 2011 Twins walked 3.0 men per nine innings. In 2010, it was 2.4; in 2009, 2.9; in 2008, 2.5. 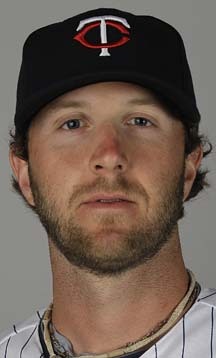 Nick Blackburn went from 2.2 walks per nine innings to 2010 to 3.3 in 2011. Brian Duensing went from 2.4 to 2.9. Francisco Liriano went from 2.7 to 5.0. Not all the starters were that bad. Carl Pavano went from 1.5 to 1.6 -- essentially unchanged, and very low to boot. Scott Baker went from 2.3 to 2.1 (and had a second straight decline of 30 innings in his workload; one of the typical benefits of avoiding walks is durability, but Baker's only reached 200 innings once). But on the whole, the Twins pitchers didn't hold up their end of the organization's core philosophy. That has to change if the team is to rebound in 2012. We opened this regular offseason Sunday feature with Rickey Henderson; we'll close it with Rickey too. Specifically, Rickey and money. Henderson's on his first go-round with the A's, and he earns a nice $1 million bonus, which the A's send him in January. The months pass, and at the end of the year the A's are doing their year-end audit, and find a $1 million descrepancy. A front office functionary gives Henderson a call. Did you get that $1 million bonus check back in January? Yep, Rickey did. Well, did you cash it? Nope, Rickey didn't. He framed it. It was hanging on his wall, so that everyday he'd see it and know he's a millionaire. The years pass. Rickey's now with the Yankees, and he gets another bonus check, something in six figures, and with the fullness of time it becomes the Yankees turn to find in their year-end audit that there is a descrepancy matching Henderson's bonus check. A front office functionary (supposedly Brian Cashman, now the Yankees general manager) gives Henderson a call. Did you get that bonus check back in January? Yep, Rickey did. Well, did you cash it? Nope. Rickey's waiting for the money market rates to go up. More years pass. Rickey is on another go-around with Oakland. Teammate Jason Giambi reaches a multi-year deal with the A's, and he and some of the other players are talking in the clubhouse about what kind of car Giambi's going to buy. Henderson gets up from his corner of the clubhouse and hands Giambi a copy of the Wall Street Journal. The others start razzing him about investing. "You can say what you want to," Henderson retorts, "but Rickey ain't never going broke." It's the law in Illinois: An Illinois appeals court, in the course of upholding a trial court's dismissal of a civil suit filed against the Chicago White Sox for ejecting a fan, ruled (in a footnote) that the Twins are the "arch rival" of the Chicago White Sox. Fricano asserts that the Cleveland Indians are “the arch rival” of the Chicago White Sox. While the two teams maintain a healthy rivalry, this court notes that it is generally accepted, at least among informed baseball followers, that the title of arch rival belongs to the reviled Minnesota Twins, to be shared, during inter-league play, with the Chicago Cubs. I assume that this ruling would be upheld on further appeal, and that a Minnesota court would concur. It should be noted, however, that the ruling specifically says it may not be cited as precedent. I wonder who a Michigan court would find to be the arch rival of the Tigers. Judging from the Tigers-oriented blogs I keep tabs on, the Twins might qualify there too. 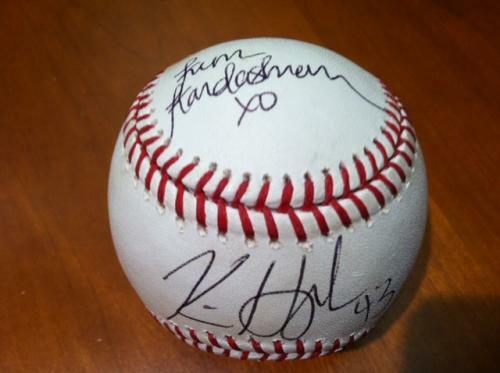 Somebody had too much money: The Kardashian-Humphries ball that the Twins auctioned for their community fund drew a top bid of $1,500. This is approximately $1,498 too much. Wakefield calls it quits: Knuckleball artiste Tim Wakefield opted against accepting a minor-league contact with spring training invite from the Boston Red Sox. He announced his retirement on Friday. So if Jamie Moyer doesn't win a job with the Rockies -- he is on the kind of deal Wakefield declined -- we will be back to not having an active 200-game winner. R.A. Dickey is now the primary torch-bearer for the flutterball pitch. I have a fondness for knuckleballers, perhaps because it looks like a pitch even I could throw. If it were that easy, of course, there would be more knuckleballers. Pitchers and catchers: The Twins batterymen report today, with the first official workout on Sunday. It's a good weekend. already on the downside of his career. Gary Carter died Thursday. That he was dying was no surprise; the prognosis from the time his brain tumors became public knowledge last summer was never good. Still, he was only 57. Carter is deservedly in the Hall of Fame; indeed, it was an indictment of the writers that it took six years for Carter to win induction. It probably didn't help Carter that he spent his prime years in the obscurity of Montreal; that he was, in his early years, a direct contemporary of the great Johnny Bench and the overlooked Ted Simmons; or that the last four years of his career were spent bouncing around the National League as a part-time player. I have a great deal of respect for the great players who are willing to stick around even after their days of stardom are over. There are always broadcasters and writers who'll bleat about how this somehow tarnishes the athlete's "legacy," but my view of it is this: The Dodgers, the Giants, the Expos all figured that the aging Carter could still help their team. He couldn't catch 120 or 140 games anymore, he didn't belong in the middle of the lineup anymore, but he could still help. Why should he step away? Carter, as I chronicled in my 2010 catcher project (a detailed examination of the aging patterns of outstanding offensive catchers, prompted by the then-looming contract extension for Joe Mauer), was used hard in his 20s and fell apart in his early 30s. This is a common pattern for catchers who can hit. The position takes a lot out of its practitioners. One of the sillier things baseball teams occasionally do is retire a number for reasons unrelated to anybody who actually wore the number. One such is now creating a bit of a controversy around the Miami Marlins. The Florida Marlins retired the number 5 even before they played their first game to honor Carl Barger, the team president who died four months before the expansion team's debut. They picked the number 5 to mothball because that was Joe DiMaggio's number, and DiMaggio was Barger's favorite player. Now, some 20 years later, Logan Morrison wants to wear the number (in memory of his father, whose favorite player was George Brett), and the Marlins are "unretiring" the number. Hey, they have a new stadium, a new name, a new logo -- let's put their one retired number back into play. And the Barger family, which had apparently been ignoring messages from the Marlins for a while, is upset. Unretiring numbers is a silly thing to do, or it should be. The core principle ought to be: You retire the number if it is so closely associated with a particular player that it will be jarring, if not unthinkable, for anybody else to wear it for that team again. Retiring a number for a team president, or owner (as the Angels did in retiring 26 for Gene Autry on the basis that he was their 26th man, or as the Cardinals did in retiring 85 for Gussie Busch when the beer baron was 85 years old) is sillier than unretiring it. You want to honor those guys, fine -- but do it in a way appropriate to their role. Of course, not many players would want to wear 85. But 5 is a rather prestigious number -- legitimately retired by seven franchises, for six Hall of Famers (DiMaggio, Brett, Brooks Robinson, Hank Greenberg, Johnny Bench and Lou Boudreau) plus Jeff Bagwell -- and 26 is pretty common also. Taking those numbers out of circulation for suit-and-tie guys who didn't actually wear it is lame. The goofiest officially retired number belongs to the Cleveland Indians: 455. That's "retired" in honor of their 455 consecutive sold-out games. And I put the word "retired" in quotation marks because who ever heard of a three-digit uniform number? It's not a legitimate number to retire. 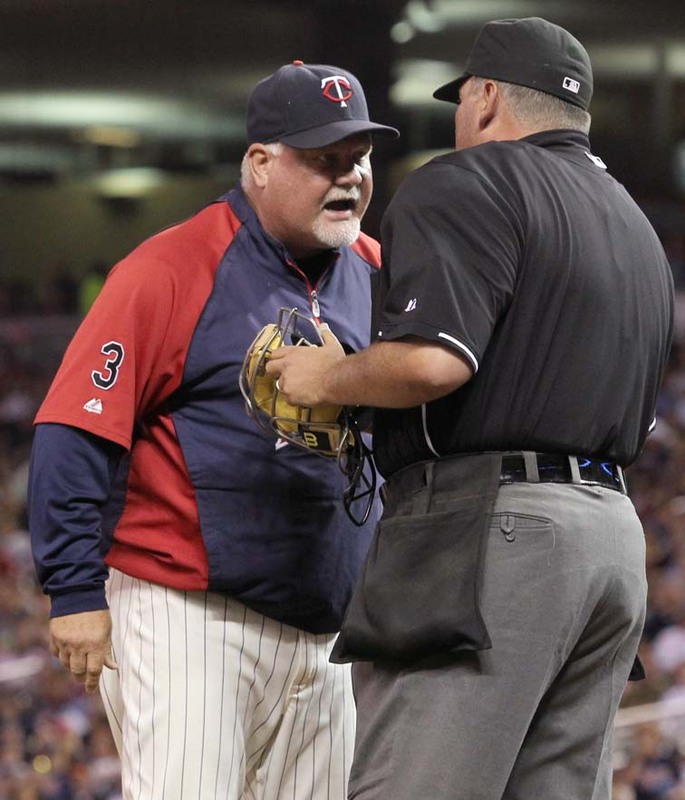 Ron Gardenhire is 866-775 as Twins manager. A recent commenter says: I'd like to hear your overall take on Gardy. That's a deceptively simple question, with a big, complex answer. One of the running themes of this blog, I daresay, is an ongoing examination of Ron Gardenhire as a manager (always, I hope, in the context of the organization). My immediate impulse when getting that question is to direct the reader here and here: "The Ron Gardenhire Project," my attempt after the 2009 season to answer a series of questions about managers compiled years ago by Bill James. It still stands pretty well despite the passage of two seasons. Some offseason in the future I'll revisit the form, but I think it too soon. Here's the thing: There is seldom an absolutely right or wrong answer for a manager. Take, for example, Gardenhire's reluctance to platoon. I grew up with Gene Mauch managing the Twins; Mauch was a platooner. I started studying baseball seriously during Earl Weaver's time; Weaver was a platooner. I am inclined to favor platoons. But I also recognize that platooning's advantages come at a price. It is difficult to develop stars when you run players in and out of the lineup. The Twins thrived when Gardenhire took over from Tom Kelly in no small part because Gardy stopping running Jacque Jones and Corey Koskie and A.J. Pierzynski in and out of the lineup. If Jones couldn't hit lefties (and he couldn't), he at least provided center field range in an outfield corner -- and keeping him in the lineup probably made him less likely to dwell on his failings. This figures to be an interesting season for Gardy watchers. As noted in the "Project," the Twins' emphasis on defense has diminished fairly steadily under his reign. Last year that backfired. Last year the Twins pitching staff was far less successful at avoiding the walk, and still couldn't get strikeouts. That's a sour combination -- more walks, few strikeouts and a sloppy defense. Making Revere a regular is one step toward reversing that direction. Last week, when the Twins designated Esmerling Vasquez for assignment, I titled the post about the move "One pitcher gone." Turns out that was premature. Vasquez slipped through waivers unclaimed. The Twins have assigned him to their Triple A roster and issued another spring training invitation. That makes, I believe, 66 players to be in major league camp, and 33 of them pitchers. It's a lot to sort through. Vasquez was waived in the final week of the regular season by Arizona. Waiver priority go by league; since Arizona, the waiving team, is in the National League, every NL team had priority over any American League team. (The Twins, with the worst record in the AL, had the top priority in the AL.) Vasquez went unclaimed by the entire National League -- at a point in the baseball calendar when all claiming him required was making room on the 40-man roster. There being little reason at this point for NL teams to have concluded that passing on him in September was a mistake, the most likely claimants would be AL teams. But with spring training just ahead, teams are more focused on their eventual 25-man rosters than on filling out their 40s -- and with Vasquez apparently out of options, a team would probably have to see him winning a 25-man spot to put in a claim. So the Twins retain Vasquez. And now they have no problems sending him to the minors this spring. Which is the likely outcome of all this maneuvering. It is, again, tinkering on the edges of the roster (in this case, off the edge of the roster). Vasquez has good stuff and subpar command of it; he needs to establish that he knows what to do with his stuff. Until then, he doesn't matter much to a major league team. he be an everyday guy? 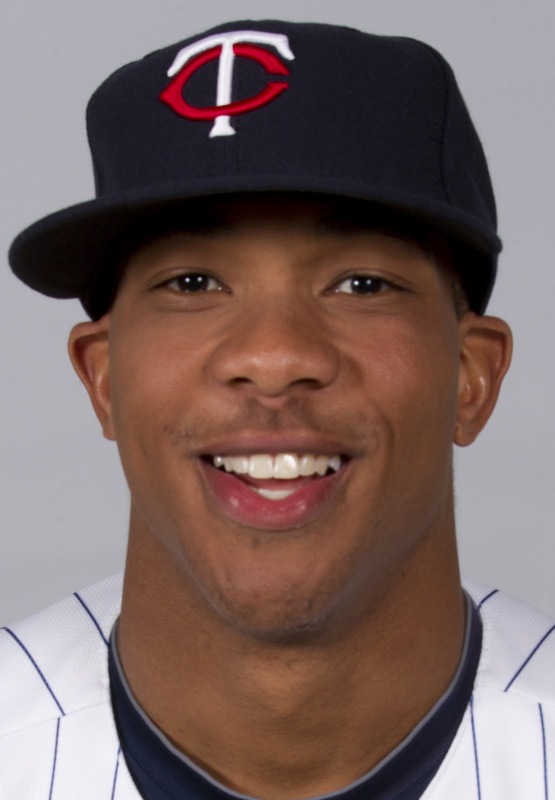 Ron Gardenhire is penciling Ben Revere in as his regular left fielder -- and as his No. 9 hitter. It is, let us say, unusual to see a corner outfielder at the bottom of the batting order. Corner outfielders are supposed to hit. Bottom-of-the-order guys are at the bottom of the order for a reason. It's certainly possible for Revere to be a more productive hitter in 2012 than in 2011. He's hit for average at every minor league stop, he seems to have an idea at the plate, and, of course, he's one of the fastest players in the league. But even if he hits .300, his almost complete lack of power at a power position is a significant disadvantage. Much of Revere's value as a player figures to come on defense, where he provides center field range (and then some) in a rather spacious left field. Indeed, I've seen some analysis suggesting that his combination of offense and defense will be more valuable than the departed Delmon Young's was. Revere's a young guy, and even such a devout platooner as Earl Weaver was wary of imposing a strict platoon role on a player before getting a handle on his abilities. Still, Revere's lack of power is so pronounced that it obviously limits his ceiling. Then there's the Trevor Plouffe factor. His major league time is also limited, and so his platoon splits may not be a real indicator of his abilities or liabilities, but he has so far been far better hitting left-handers —.301 vs southpaws, .201 vs. right-handers. If Plouffe is to be on Gardenhire's bench, it would appear to behoove Gardy to get him in the lineup against lefties. Plouffe could be a platoon partner for Revere. Plouffe could also be a platoon partner for the switch-hitting Ryan Doumit, who has over his career hit better against righties than against lefties. Sit Doumit, and Plouffe could DH or play right with Josh Willingham DHing, or first with Justin Morneau DHing. Doumit's platoon splits aren't as pronounced as Plouffe's at this point, but they are considerably well established. All this is probably irrelevant. Gardenhire has shown little tendency in his managerial career to lean on the platoon differential when deploying his bench players. I don't expect that to change this year. But I wish he would. We're dealing here with flawed talents. It would make sense to use them ways that maximizes their strengths and minimizes their problems. When Joe DiMaggio broke in with the Yankees in 1936, he hung out with Tony Lazzeri and Frank Crosetti. All three were of Italian descent, all three were from San Francisco, and all three were notoriously quiet. One of their favorite "activities" was lobby sitting, which was exactly what it sounds like: Sitting in the hotel lobby watching people come and go. Lobby sitters didn't converse; they sat. A reporter one day saw the trio taking their place in the lobby and, with nothing else on his agenda, decided to time their silence. A half hour dripped by without a word, then an hour. An hour and 20 minutes in, DiMaggio coughed. Crosetti said: "What did you say?" Lazzeri said: "Shut up. He didn't say nothing." They lapsed back into silence. The writer gave up about 10 minutes later; it was making him crazy. The longer I run this blog, the more certain I am that I don't really know what my readers will respond to. I figured my post earlier in the week on the Kim Kardashian/Kris Humphries ball would get some reaction; nothing. I figured my post earlier today on a possible change in a minor league affiliation was a throwaway; I got four comments, which is a lot for this blog. And what's more, I wanted to respond to each.Very unusual. Thrylos98 commented on the distance between the major league team and their top affiliates and said it's unusual. I don't think it is, particularly for Midwestern teams. There are no Double A leagues in the Midwest; the Double A leagues are the Eastern League, the Southern League and the Texas League. As for the Triple A: There are few Triple-A caliber cities in vicinity of Minnesota, and Des Moines (Cubs) and Omaha (Royals) ain't switching. (The devotion of Omaha fans to the KC affiliation is such that one attempt to change the team's nickname from Omaha Royals died of popular rejection.) The White Sox's top affiliate is in Charlotte; the Brewers' is in Nashville. There's nothing the Twins can do about geography. Andy asked about the Blue Jays Triple A affiliation with Las Vegas. Truth is, nobody wants to be affiliated with Vegas; that's largely a function of the hitter-happy environment. It's difficult to develop pitchers there. And being in the Pacific Coast League is particularly awkward for an Eastern team. The Jays would likely jump at an opportunity to get back to the International League, but that's not related to the Eastern League shuffle I was describing. I would think the Twins want no part of Vegas, and doubt they want to be anywhere in the PCL.Which is part of why they want to keep the Rochester people from looking elsewhere. Andrew, I know, posted a piece a while back on his blog about Bill Smith representing the Twins at a RockCats event last month. Smith, he says, praised the player development at New Britain and a few other affiliates while saying nothing about Rochester. That, I think, says more about the coaching staffs than about the affiliates. The Twins have replaced the manager and hitting coach at Rochester. Teams may be discontented with facilities or travel issues regarding specific affiliates and want to move accordingly, but if the players aren't developing, that's a personnel issue, not an affiliate issue. But it takes two to be happy with an affiliation. The Twins hooked up with New Britain in no small part because they had a relationship with New Britain owner Joe Buzas, who also owned the Salt Lake City Triple-A team the Twins were then affiliated with. Buzas died in 2003. It's possible the Rock Cats' current ownership would rather link up with the Mets, whose fan base is practically next door. And JimCrikket suggests the Twins might want out of Beloit, their Midwest League affiliate (low A). They might indeed; Beloit is not regarded as one of the gems of the league, although I suspect there are others (Burlington and Clinton, for example) whose facilities might be even less well regarded. I know the Twins were unhappy when Quad Cities ditched them for a St. Louis affiliation. Personally, I'd love to see the Twins in Cedar Rapids, but I don't know how likely that is. The Twins have made no secret this offseason of their concern about their Triple A affiliation with the Rochester Red Wings. They like having their top minor league affiliate there for a variety of reasons, but the Wings are free agents after the 2012 season, and the Twins have not provided them with sufficient talent to win in recent years. Which is why the Twins imported Gene Glynn (Waseca and MSU hero) to manage in Rochester, and why they've signed umpteen minor league free agents. It isn't just about winning here, it's about winning there too. The Double A affilation, it appears, may also be in jeopardy. The Twins have been affiliated since 1995 with the New Britain (Conn.) RockCats in the Eastern League. That's where Chris Parmelee and Joe Benson played last season before their September call-ups and where Liam Hendriks spent most of 2011 as well. Follow these complexities: The New York Mets' longtime Eastern League affiliate, the Binghamton Mets, are reportedly about to be sold and the franchise moved to Ottawa, Canada. Once in Ottawa, the idea is that they will affiliate with the Toronto Blue Jays, the major league team of choice in the Canadian capital. That makes sense. The Mets would be without a Double A affiliate. Both ESPN New York and Newsday have reported in recent days that they would align with New Britain; Newsday notes that New Britain is actually an hour's drive closer to New York than Binghamton. The Twins, under this scenario, would wind up connected to the New Hampshire Fisher Cats in Manchester, N.H. I've no idea if that would be seen as a better or worse affiliation for the Twins. But at least it would keep the Twins affiliated with a Something Cats. Almost three weeks ago, after my superiors at The Free Press announced plans to offer digital subscriptions (or, put another way, erect a paywall on our newspaper's website), I posted here about the implications for this blog. To update: The status remains quo. Oh, the digital subscription thing is under way. But this blog, and the others maintained by my colleagues, remain on Blogger. When I wrote the previous post, the powers that be had scheduled a webinar to unveil a blog function on our web platform. The day I published that post, the webinar was postponed indefinitely. No reason has been given, but the assumption here is that the blog function isn't ready. If and when it will be is unknown to me. So the final sentence of the earlier post remains effective: I'll let you know when I know. 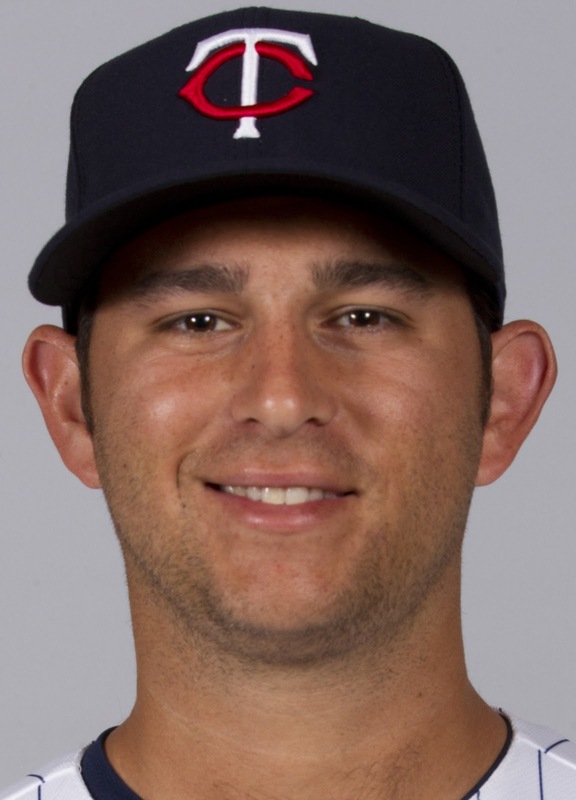 The Twins on Thursday picked up outfielder Darin Mastroianni on waivers from Toronto. To make room for him on the 40-man roster they designated pitcher Esmerling Vasquez for assignment. Mastroianni, who is 26 and appears to have at least one option left, isn't real likely to make the 25-man roster, barring injuries to the center fielders ahead of him (Denard Span and Ben Revere). Like them, he's a speedy guy without much power; he's shown excellent stolen base rates in the minors and, as he's reached the upper levels of the Toronto system, has drawn walks. He figures to give Rochester a legitimate center fielder, which will make it easier for Gene Glynn to focus Joe Benson on mastering an outfield corner. Vasquez winds up never having thrown a pitch for the Twins; they picked him up on the next-to-last day of the season in 2011 and cut him less than two weeks before pitchers and catchers report. He is arguably better than Jeff Gray, who remains on the 40-man roster, but if I was right in my attempt to figure out how many options the pitchers have, Gray offers a bit more roster flexibility. It's possible Vasquez will clear waivers and remain in the Twins system. Either way, this is definitely tinkering at the edges of the roster, with a greater impact on the Triple A team than on the major league squad. We're obviously a long ways away from baseball's amateur draft, and a lot can change between now and June. Things will start changing pretty soon as the college baseball season gets going. The Baseball America that showed up in my mailbox Wednesday is built around their college preview, and includes a few early draft nuggets of interest to Twins fans. BA, which does a top-notch job of reflecting the scouting consensus, says this year's draft field is nowhere near as impressive as last year's, which was regarded as very high quality. The falloff is largely in college talent. College talent, of course, is generally more developed and closer to major league ready than high school talent. Lucas Giolito, RHP, Harvard-Westlake High, Calif.
Byron Buxton, OF, Appling County High, Ga.
Again, I wouldn't get too wound up with that ranking. There's a lot of amateur baseball to be played between now and the draft. Somebody not in that list may well rise; some in that list may fall. All it means is that right now, those are the five guys the Twins -- who have the No. 2 overall pick -- are probably most focused on. Minnesota, which also has a number of compensation picks from the departures of Michael Cuddyer and Jason Kubel, figures to have the highest bonus pool to draw upon, about $12.4 million. The bonus pool is a new complication to the draft; teams are allotted a certain amount of money to spend on their picks in the first 10 rounds, and there are some rigorous penalties for exceeding the pool amount. marriage; Kris Humphries signed the sweet spot. Considering the mishmash of memorabilia that currently makes up the header for this blog, I'm probably not a guy who should jeer at collecting baseball items. But the news Tuesday that the Twins will auction off (for charity) a baseball signed last summer by the (un)reality TV couple Kris Humphries and Kim Kardashian ... I don't know any other way to react than to give it a raspberry. I certainly understand why the Twins would be eager to rid themselves of willing to part with this particular memory. I would think they'd like to auction off any evidence on hand that 2011 ever occurred. But really: Who would want this ball badly enough to pay for it? And why? Ben Revere had several memorable catches last season. This is no real surprise: During the Twins Caravan/Twins Fest pre-spring training promotional period, manager Ron Gardenhire consistently said he wants to lock Denard Span into the center field job, with Josh Willingham in right and Ben Revere in left. Making Revere a regular at all. These are connected, but ... let's deal, today, with the alignment question. There are those -- such as Michael Rand of the Star Tribune -- who think it would be more effective to put Revere in center with Willingham in his accustomed left field and Span in right. Examine the skill sets. None of the three has a true right field arm; Willingham, easily the slowest of the trio, is a converted catcher, which suggests he may have the strongest arm of the group. Revere has eye-popping range in center, but Span is quite good out there as well, and his arm is better than Revere's. Gardenhire believes it's more important to keep his regulars comfortable. Willingham is used to playing left, but has agreed to shift to right -- and Gardenhire sees his part of the bargain as not moving him back and forth. Span prefers center to an outfield corner. And while Revere is the front runner for a regular position, his weaknesses could turn him into a part-timer. That, I think, is a prime reason to go with Span in center. It appears likely right now that the reserve outfielders will be Ryan Doumit (who'll also DH, catch and play first base) and Trevor Plouffe (converted infielder with little outfield experience). Neither is any sort of center field option. If Revere loses playing time -- if, for example, he winds up platooning with Plouffe -- Gardenhire doesn't want to move Span around. Gardenhire is not a big platooner, but his outfield plan certainly makes it easier to go to a platoon arrangment in left. And it makes it easy to handle his RF/1B/C/DH set up, in which he has four regulars (Willingham, Justin Morneau, Joe Mauer and Doumit) for four positions and he can mix and match to rest his position players. The Polo Grounds, home to the New York Giants for decades and briefly the setting for the foolishness of the early Mets, was a weirdly-shaped yard -- more than 500 feet to straight-away center, barely 250 feet down the lines. Famous plays resulted from the dimensions of the oval. Willie Mays' over-the-shoulder catch in the 1954 World Series was made more than 450 feet from home plate; Bobby Thomson's "Homer Heard 'Round the World" to win the 1951 pennant probably didn't go 300 feet. The phrase "That would've been a home run at the Polo Grounds" was often heard in other parks to deride routine fly balls ... Following a tour the Giants had made in Japan, I served as master of ceremonies at a Giants Booster Club luncheon, and in introducing Mays to the audience I described a play he was said to have made in Tokyo. It seems that with bases loaded, the batter put up a fly ball to center field. The ball was caught up in one of the winds that are sacred to the Japanese, and Mays saw that it was going to carry out of the park. But he also noticed that the exit gate in center field was open. So he raced through the gate and found himself on a tree-lined avenue running away from the ball park. Going in the same direction was a fire engine in the process of answering a call, so Mays hopped aboard. Three blocks farther, he reached up and made the catch. One fireman at the back of the truck turned to another and said, "Home run at the Polo Grounds." The tale having been told, I presented Mays and sat down while he fielded questions from the audience. Toward the end, one rather unexpected query came up. "About that time you caught the ball while you were riding on the fire engine in Japan," the questioner asked, "did the guy from third score after the catch, or was your throw in time to get him?" That got a better laugh than the story itself. Mays, however, handled it straight-faced. "I didn't make any throw," he said. "Didn't have to. There was two out at the time." on Monday: "It was just wrong." 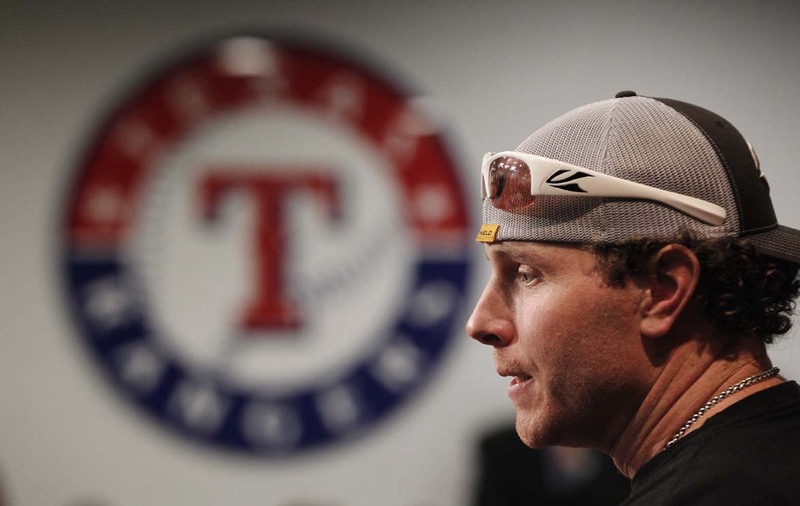 Word got out late Thursday that 2010 AL MVP Josh Hamilton had been seen drinking at a bar in the Dallas-Fort Worth area earlier in the week. Since Hamilton is baseball's most notorious recovering addict, it was big news — big enough to prompt a Hamilton mea culpa press conference on Friday. It's not Hamilton's first relapse since his return from the abyss, but it certainly came at a sensitive time: The outfielder is going into his walk year, and contract talks between his agent and the Texas Rangers were broken off in the immediate wake of his relapse. I find myself wondering, however, not so much about what this latest slip means for Hamilton the ballplayer as what it suggests about his post-baseball future. Both this and his previous relapse, after all, came in January — in the heart of the offseason, in a time when the structure of the season isn't available. Also, there are a lot of people around him (again, particularly during the season) who want, if only for selfish reasons, to keep him sober and productive. He has a support system, frayed as it may be, in place — but it has a lot to do with baseball. And baseball is only a part of life, even for a talent as magnificent as Hamilton. Someday his playing days are going to end. The financial incentive for others to help him stay in line will vanish. The lure of tomorrow's game won't be there. If he struggles to stay sober in the offseason, what awaits him when his permanent offseason arrives? For an addict, sobriety is always a daunting notion, but in Hamilton's case, it seems even more difficult. Teams have 40-man rosters, from which they devise their 25-man active rosters during the season. The 15 athletes not on the active roster are either on the disabled list or "optioned" to the minors. A player can only be optioned out in three different seasons, so a player's option status is often a significant consideration. There is, so far as I know, no authoritative Internet site that tells how many options a player has. With so many pitchers scheduled for the Twins spring training camp, and so many of them new to the organization, ascertaining option status is a rather difficult task, yet essential to understanding the dynamics of the competition for spots on the 25-man roster. The Twins have 15 pre-arbitration pitchers on their 40-man roster. The other eight make enough that the Twins aren't going to option any of them out this spring; Nick Blackburn either opens the season on the 25-man roster or on the disabled list, but he's not going to be pitching for Rochester in April. So for this exercise, I'm ignoring the projected rotation (Carl Pavano, Scott Baker, Blackburn, Francisco Liriano and Jason Marquis) and the three veterans (Matt Capps, Glen Perkins and Joel Zumaya) in the bullpen. Scott Diamond: Two options left. Terry Doyle: Three options left, but that's immaterial at this point. He's a Rule V draftee, which means the Twins have to keep him on the 25-man roster or return him to the White Sox. Diamond was in the same position last year, but the Twins traded for his rights at the end of camp. Brian Duensing: At least one option left. I'm not certain of when he was added to the 40-man roster, and it's possible that he has two options left. The Twins aren't real likely to use one in any case. Jeff Gray: One option left. I think. No options remaining. Deolis Guerra: One option left. Carlos Gutierrez: Added to the 40 this winter, all three options left. Liam Hendriks: Added to the 40 and 25 rosters late in the season, hasn't been sent down since. All three options left. Jeff Manship: Again, I'm not sure exactly when he was added to the 40. He might be out of options, he might have one left. Lester Oliveros: Fairly sure he has two left. Tyler Robertson: Like Gutierrez, all three options left. Anthony Swarzak: Out of options. Esmerling Vasquez: He's been up and down with the Diamondbacks the past three seasons, so he may be out of options. His 2010 minor league stint was just one game, which might have been a rehab stint, but there's no gap in his major league time corresponding to a DL stint. Kyle Waldrop: Like Hendriks, added to the roster late and not sent down. Three options left. There are a number of Twins bloggers -- most prominently Aaron Gleeman -- vocally unhappy with the Twins' activity, or lack of it, in the middle-relief free agent market. As Gleeman sees it, Terry Ryan and Co. erred first by re-signing Matt Capps, then by bypassing a flock of veterans who have signed more cheaply than Capps, or who haven't signed at all (yet). I don't share Gleeman's displeasure. I'm inclined to agree with Ryan's sense of Capps' ability and value, to begin with; as much as I respect Gleeman's analysis and insight, I suspect he's holding the Wilson Ramos trade against Capps. 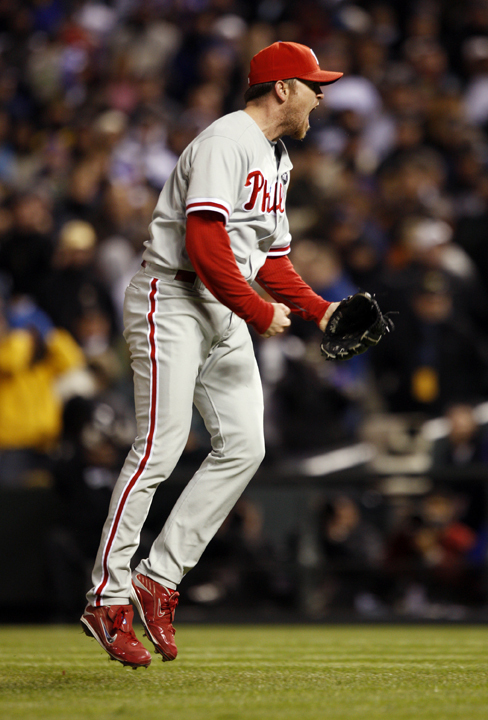 in 2011 for the Phillies. Most of the relievers on Gleeman's list are older guys clearly on the way down and increasingly relegated to low-leverage roles. Brad Lidge? His fast ball is gone; he's basically down to his slider now, and while that remains a high-quality pitch, the amount of time he's missed in recent seasons suggests that it takes too heavy a toll. If the Phillies thought he had use, they wouldn't have so emphatically walked away from him. Jonathan Broxton? We'll see how he fares in Kansas City, but for my money he's a classic case of Joe Torre bullpen burnout. Jon Rauch? LaTroy Hawkins? Been there, done that. That the likes of Dan Wheeler and Chad Qualls are signing minor league deals elsewhere does not disturb me. The Twins have plenty of non-roster invitees, maybe too many -- but they are generally younger and unestablished, and to me that offers the possibility of finding a hidden gem. Wheeler is 34, had an ERA above 5 for most of 2011, didn't pitch at all after Sept. 7 and was seldom entrusted by the Red Sox with game situations. Are the Twins really losing out on anything there? Maybe Wheeler is better than (picking a 40-man roster arm at random) Kyle Waldrop, but I doubt the difference is significant enough to opt for certain mediocrity over possible mediocrity. I think the Twins can get from the unknowns at least what they would be getting from the known quantities, and possibly -- possibly -- more. 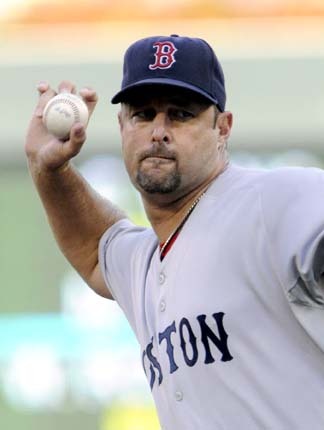 Tim Wakefield is 45, and he went just 7-8, 5.12 last season. The veteran knuckleballer hasn't had an ERA below 5 since 2009, hasn't qualified for the ERA title since 2008, hasn't had an ERA below 4 since 2002. It's February, and the Boston Red Sox have not offered him a contract. 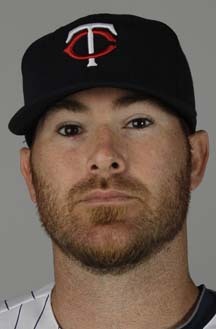 He has had nibbles from other organizations, but he has long said he won't pitch for anybody other than Boston. It looks like the end for Wakefield. If so, it's been an odd career, odd enough that it may be unique. He has 200 career wins (on the nose), but never won more than 17 games in any season. He hit the majors as a 25-year-old flutterball savant -- in his half season in 1992 with Pittsburgh, he went 8-1, 2.15, won a couple more games in the playoffs, and looked like he was set for a long run as a top-flight pitcher for years to come. And then he crashed and burned and rose again: 6-11 in 2003, back to the minors in 2004, re-emerged with Boston in 1995 with a 16-8, 2.95 season. He had two half seasons in his 20s -- 1992 and 1995 -- in which he had a case for being the best pitcher going. He wasn't. He was a durable utility pitcher -- he won 17 games for the Sox as a starter in 1998, then led the team in saves the next season -- and Boston rewarded him, but he was never an ace. He ground through his 30s and into his 40s as a back-of-the-rotation guy. Knuckleballers, as a rule, mature late. It's a rare k-baller who shines in his 20s. It takes time to master the nuances of the pitch, and, I suspect, to master the emotional aspect of relying on the unpredicable. Knuckleballers also, as a rule, get their chances with bad teams. Wakefield is an exception to both rules. Simple theme. Theme images by tacojim. Powered by Blogger.